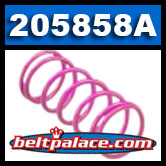 Comet 205858A | “PINK” Spring Kit for 94C Series Drive Clutch. Home > Comet Clutches and Parts > Comet 211483A Puck Kit for Ribbed Cover 94C Duster. 3-Pack. > Comet 211477A Wedge Activator Pucks. Solid Plastic. Package of 3 > Comet 205858A. 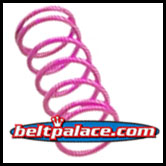 “PINK” Spring Kit for 94C Drive Clutch. Standard clutch spring on Drive units 206095A, 206097A, 206098A, 212629A, and 213051A. Comet Duster 94c Mod kit 205858A. For use with Comet 94C Series Centrifugal Clutch drive systems: 206095A, 206097A, 206098A, 212629A, and 213051A. Genuine Comet 205858A Roller Weight Kit (PINK) for Stock Engagement of 1800 RPM with Six Comet 206514A Puck Weights. Made in USA by Comet Industries.